I’ve come to find my own path when it comes to self-managing my chronic illness. However that’s not to say there’s not anymore to learn once you’ve started to accept and work with your illness. It’s also not easy for everyone to find acceptance alone, as this depends entirely on you and the severity of your endometriosis and your willingness to be open to ideas. It’s particularly hard if you’ve been newly diagnosed or you’ve struggled for many years and don’t see a way out. I’m happy to say there’s always more you can do to improve your quality of life. So with that in mind I signed up for my local Expert Patients Programme. If there’s one in your area, and you’ve not already tried it to help manage your endometriosis. I’d highly recommend that you do the same. What is the Expert Patients Programme? The idea behind the Experts Patients Programme is that unlike short-term illness, long term illness doesn’t necessarily have a simple cure or solution. Acute illness (with a beginning and end) can generally be resolved by a health professional, but a long-term illness requires more patient involvement and understanding so you can manage your own treatment between your health professional updates. I think the name might come from the fact that we as patients get to know our illnesses more keenly and with more detail than our GPs. We become the experts of what managing with chronic illness is like and as such all of the advice on the Expert Patients Programme comes from patients themselves. The people running the course have long term illnesses and teach from a position of personal experience of how hard it can be. In the UK the course is normally run through the Expert Patients Programme CIC, or an independent group through your local NHS (search your local NHS trust website). This system does exist worldwide though and was originally created in America, so it’s not just UK patients that can benefit. The course I went on lasted six weeks and was completely free. All the course leaders asked was for a commitment to attend all six sessions, and of course you need to have a long-term illness. It doesn’t have to be a physical illness either, mental health is just as important and I’ve seen first hand how different people with different types of illness have benefitted from the course. The course plan was really enlightening and very useful. I’m sure there are more than a few headings in that list that may be of use for you. Different topics were covered each week. So the key thing I’ve taken away each week is that there’s no single approach to helping yourself with a long term illness, only a multitude of things that you need to try, retry and maintain daily. 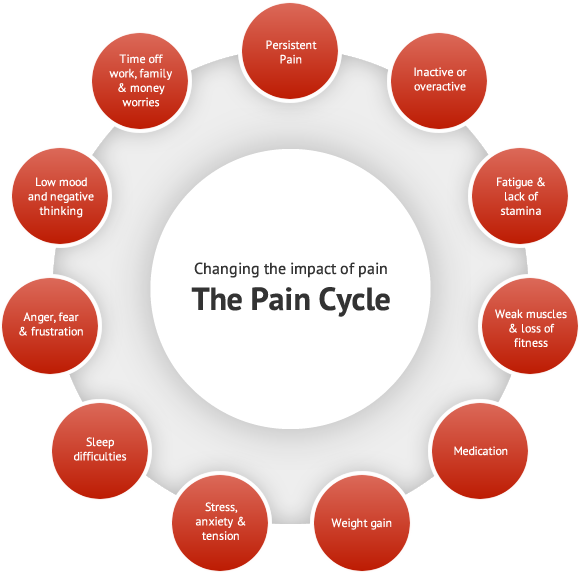 We’re taught how to populate our pain toolbox, by developing a series of skills using the sessions above to help you better manage with the challenges of the day. This will help to break up the chronic pain cycle. The really nice thing about the EPP was getting to spend time with others who are chronically ill. Although there was no one else in my group with endometriosis, there were people with a wide variety of long term conditions who despite our differences were sharing a lot of the same issues and worries about how their life is now and how life might be in the future. Generally speaking you’re asked to leave your long term condition at the door after the first session where you share as much as you want to about your experience with ill health. However I never waste an opportunity to talk about what endometriosis is and I’m very happy to say that although no one in my group had heard about endometriosis before, many of them asked me a lot of questions about it’s impact on my quality of life, it’s symptoms, it’s prognosis and whether it can be cured. It just goes to show that other people with long-term health conditions are generally more willing to hear about other conditions and how they impact other peoples lives. So how does EPP help with endometriosis? One thing that’s made clear to us every week during each session is that we know the most about our personal circumstances with illness, so all the advice on offer has to be carefully cultivated by you to amend it to your personal circumstances. By attending an EPP course you’ll get a general framework to start on the path to self management, and carrying on with the skills you’ve learnt is up up to you. You can pick and choose what works for you out of what you’ve tried over the six weeks and come up with your individual plan. I personally found dealing with difficult emotions useful, where we discussed better ways to manage when we’re feeling sad or angry, to avoid “volcanoing” our emotions where we push them down so far into ourselves that the emotions explode over something really flippant later on. This is a tricky part of living with and communicating about endometriosis, so I know that part will be of particular use to many of you. The importance of setting a bedtime routine to get a good nights sleep was useful too, as was physical activity and exercise. I often hear people with endometriosis say that it’s impossible for them to do any activity as their endometriosis makes them afraid to move. The EPP course shows you ways to try activity that you might not have thought of. Like any ideas discussed, they all come from other patients living with long term pain. I’d recommend seeking out an EPP course for those of you who have had surgery and ongoing treatment and while life has improved you’d like to see some more improvement and regain some control back over your life. Use it as an experience to find out what has helped others and might help you in the future. Best of all, be amazed by the realisation of how much you’re managing already. Give this your local Expert Patients Programme a try, it can’t hurt.